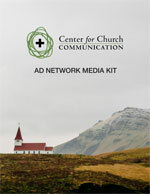 Thank you for your interest in partnering with the Center for Church Communication (CFCC). More than an advertising opportunity, we see this as a partnership. Our mission is to help churches communicate better. As a nonprofit, we’re here to support, encourage and empower church communicators. The goal is always helping the church communicate the gospel more clearly. When the local church wins, we win. We hope you’ll consider joining us in that mission. Your support and sponsorship can help churches communicate better. We offer multiple opportunities to reach church leaders through our website, social media, email list, events and more. There are also discounts available for multi-month commitments and custom packages. For further questions, or to request placement in the CFCC Advertising Network, contact Brad Abare. Thanks. We look forward to partnering to help the church communicate better.